Some people like physical books. They like the feeling of browsing through a book, feeling its pages, taking notes the old-fashioned way (with a pencil or a pen). Me? I’m a technology aficionado. I like to adapt to technology changes and import these in my everyday life. Therefore, I like eBooks more than anything. And for me, these are the top reasons why an ebook reader is better than any physical book. Imagine having your digital library with you, anytime, 24 hours a day. That’s what an eBook reader is capable of. You can have as many books as you want, at the time that you want them, with notes and highlights. And all that at a fraction of the weight of a single physical book. A physical book has a spe cific font, font size, margins, and spacing. And this, of course, cannot change. This means, get your magnifying glass, your reading glasses, and a light – if it is dark. An eBook reader (as well as reading apps from mobile devices) allows you to change this to fit your needs. eBook readers allow for browsing through the respective bookstore’s collections. When you like a book, you can download a sample and start reading it. If you like the sample, you can buy the book – provided that you have a payment method set up- download it (provided that your devices have Internet access – most are equipped with Wi-Fi Technology), and start reading! You can even use the manufacturer’s (e.g. 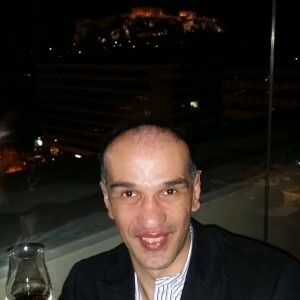 Amazon’s or Apple’s) site or mobile app, pick a book, send it to your reader and… have fun! Oh, one last thing: You can add any book you want on your ebook reader. Don’t know the meaning of a word you stumbled upon? Have no fear, eBook reader dictionary is here. Just pick the dictionary you want – it will be downloaded in seconds, provided your device is connected to the Internet- highlight the word, and voila! The meaning of the word pops up on your screen, along with example sentences for you to understand the meaning. This is a great way of looking up and learning new vocabulary, without having to carry a dictionary (another physical book) with you at all times! This feature is also present in mobile apps as well! As a bonus, some readers, allow you to save those words and come back any time to check the meaning of any word or even see the words you have looked up! Kindle and Kobo devices have a feature that is really interesting – but might keep you awake all night, trying to finish another chapter. This is reading progress. 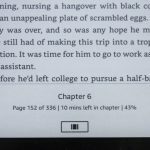 As you can see in the picture below, a user can see in real time the page they are on (the only common with physical books), percentage completed, and time left to finish the chapter and the book – based on your reading speed. See why you might stay awake all night to finish “one more chapter, five more minutes”? So, what do you think? Have I persuaded you to make the shift to eBooks? What else would you like an eBook reader to have? Please let me know in the comments below. Thanks! I’ve always been a book lover, the smell of a new book, how beautiful they look on a shelf… but I guess everything has its time, right? Thanks for the article, very interesting and insightful. Thanks for your kind words. These are the main reasons I love eBooks (and eReaders) . I’d be glad to assist you with any questions you might have. I noticed that when I read eBooks on my smartphone, it’s easy to get distracted with phone calls and social messengers. Hence, I actually have a few books from last year (2016) that I haven’t yet complete. Your suggestions of getting an eBook reader makes a lot of sense. It keeps your focus on the books, the content and restore the enjoyment of reading a book. Which product would you recommend in terms of costing and usability? Thanks. It is true that eBook readers have no distractions when reading. But eBook reading apps on the phone allow reading anywhere, anytime, even if you forget your eReader. 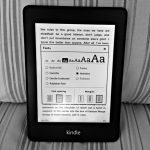 What I suggest (and use) is Amazon’s Kindle Paperwhite. Not to expensive, and in my opinion the best value for money. I’d be glad to assist you with any other questions you might have. Okay so I see the reasons. However, what if it crashes? What if the device is broken into pieces and melted in rain? The thing is that people depend so much on technology, I don’t understand why they just don’t give the old fashioned type of doing things a try. We have become accustomed to e-books. They can be read anytime, anywhere from your phone and tablet, very convenient. The traditional book is more difficult. You will not open it everywhere, it is inconveniently large. I am for e-books. True that… e-books are much more convenient to carry/ You can carry a lot of them, even on the device most people carry on a constant basis; the mobile phone. There are great apps to read on a mobile phone. You can even carry an e-reader, a device specifically built for reading ebooks, such as a Kindle. I have have never really been an ebook person but I guess it is because I had very little knowledge on it. An ebook sounds really handy and am definitely gonna try one. I especially enjoy African novels though am not sure whether they are available in the Amazon Kindle.Thanks a lot for shedding light on this. As I have stated many times, it is a matter of personal preference. I’d suggest you give the eBooks and ereaders a try. Yoiu can check Kindle’s catalog of books to see if you can find African novels. You can also upload or transfer books to Kindle. Hey there Marios! I agree with you, even though good old fashioned paper-books will always have a special place in my heart I love reading them on digital devices. I love that I can have as many books with me as I want and that I can have them now and not later lol. It’s so cool to be able to read reviews on books all in the same app I use to buy them. Also, I’m sure that by supporting ebooks instead of paper books it helps save a lot of trees… I’ve been using my phone and I’ve been wanting to get a tablet mainly for reading. Do you recommend a Kindle, iPad or an Android tablet? Thanks for your kind words. Paper books have their grace as well though – especially if you want to use them as reference books. If you’d like to have a tablet as well, I think that a Kindle Fire, could be your solution. I have tried in the past to use one of these but for some reason I didn’t like them. They are of course far more practical than having a paper book and far better than reading on a smartphone or tablet but for some reason I still prefer the plain old paper. It gives me some warmth that no ebook reader can. But for someone that prefers practicality they are actually very good. I prefer printed books in the case I need them for reference. I think we are still more used to go back and forth with a physical book than an eBook – although eBooks are getting great in that aspect as well. In the end, it is a matter of personal preference. Thanks for stopping by! Like most people early on, especially the book worms in our society, reading a good book the normal way was the way to go. Nothing wrong with pulling books from the library. if their in stock, settling down and getting educated or entertained. Gone are the old-fashioned ways, and in with the ebook format. I still find myself today, going to the library and getting regular books. That way of life will never die! Ebooks are the coolest and most easiest way to obtain information. I recently wrote and put an ebook out myself online. No muss, no fuss! Adjust the reading fonts to your comfortable level. Do you think ebooks would’ve been more popular ‘back in the day’ then in today’s times now? True that, the eBooks are very convenient. And you can always borrow eBooks from your local library. There is also an app for that! You can use Libby or even Google Search to find books you can get from your local library. And self-publishing is also a huge trend nowadays.